stickman's corral: China to reduce coal consumption? China to reduce coal consumption? I've tried to emphasise the importance of relative concepts many times on this blog. However, there are occasions when relative measures can also be more than a little misleading. Case in point: This article from Reuters, which describes how China plans to reduce its coal consumption to 65% of primary energy by 2017. However, despite being a tentative step in a right direction, this is hardly a watershed moment. In fact, the US Energy Information Agency (EIA) was already forecasting a drop in Chinese coal consumption to 65% of total energy by 2017 (from 69% in 2012) in the reference scenario of its International Energy Outlook, which was published earlier this year. 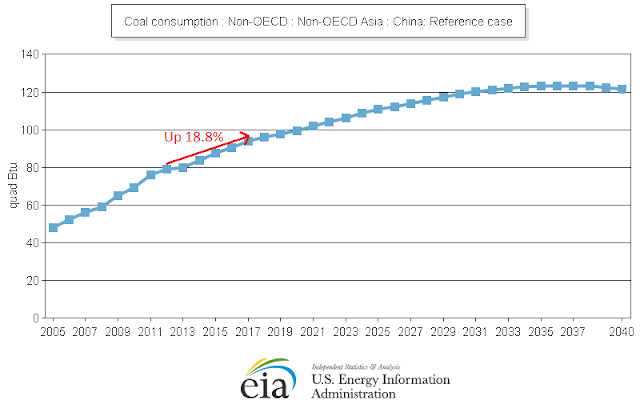 More importantly, this relative decrease glosses over the fact that the absolute consumption of coal is forecast to increase by nearly 20% over the same period... Up from 79.2 quadrillion Btu in 2012 to an eye-watering 94.1 quad Btu in 2017! THOUGHT FOR THE DAY: Be wary of anyone who tells you that China is leading the race in de-carbonising their economy, or winning the battle on renewables for that matter. There may be an element of truth in such statements, but the bigger picture is far more sobering. However, it was mainly due to slowdown in cement, steel and plate glass production. As per my request on the comments form: No anonymous comments please.